“I have two children, a boy and a girl who are both currently attending junior high school. They are both facing immense pressures to fit in, achieve good grades, do well in sports and maintain a healthy lifestyle. After reading this book, I have learned that I am doing many things well as a parent. I have also learned that I am doing other things not so well. This book has provided me with excellent guidelines as to what I can do to improve as a parent and what signs to look for in my children in order to make sure they are doing ok. I don’t think that bullying will ever completely go away, and kids today have it a lot worse than when I grew up with the growing prevalence of social media. As someone who never had to deal with this, this book gave me a clearer understanding of the type of bullying that goes on in schools today. It also provided me with a variety of strategies on how to deal with bullying and help my children. “When parents have children, there is no guide book. We learn as we go along and ask other parents about their experiences with their children. In this 21st century, parenting has taken on added pressures and challenges. Eyes Wide Open gives us insight into many of the questions and struggles that families may be experiencing in their lives. 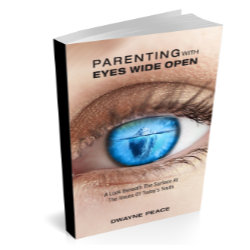 “Parenting with Eyes Wide Open is a game changer – Dwayne Peace has not only seen the devastation that comes from bad parental decision making, he has helped reverse consequences that come from those decisions. This book demonstrates, with clear examples, the impact that positive choices make in the lives of kids and in the lives of their parents. “When I received word that Dwayne Peace was writing a book to expand and reach out to a wider audience with his message I was very excited. I have been a Secondary School Principal for over 20 years and have worked in 3 high schools on the brink of closure to see them thrive to the top of their districts. In every school I have been a Principal in, Dwayne Peace has been integral to this process. It is my hope that his book will be the tipping point for schools and districts deciding to invite him in for his “Life’s Synergy for Youth” presentations and workshops. Dwayne’s workshops change the culture of a school community immediately for the positive. A school community in which less than 40% of the students and parents surveyed responded they felt safe at school, transformed into a safe, joyous community where 100 % of the students and parents surveyed in later years responded they felt safe and cared for. Not just a one-year response; but 100 % of the population feeling Safe and Cared for THREE YEARS IN A ROW! Dwayne’s message and small group sessions “Life’s Synergy for Youth” was the tipping point for such school culture transformation. He connects with staff and students as well as parents and mediates a culture where youth immediately feel that staff and parents are there to support them. The information Dwayne provides to students is greatly appreciated by youth. They understand and relate directly to his message and you can immediately see youth connect with Dwayne and feel safe and comforted by the fact they see an adult who understands and cares about their world. Understanding what goes on below the water line. They appreciate his message. I have been with a gym full of over 900 students where everyone of them sat completely engaged with Dwayne even though the lunch bell rang! Dwayne’s work with youth in small group sessions will have the most profound impact in creating a positive, open, communicative culture with youth. Young people greatly appreciate that somebody finally “gets them”, understands their fears and struggles and gives them real answers about how to deal with situations, and real-life struggles. They connect immediately with Dwayne and he provides the distinct tipping point within a school culture transformation where students become completely at ease and truly recognize that school staff and parents are there to support them. I have become close friends, allies and supporters with even the most difficult, disconnected students as a result of the connections made through Dwayne’s mediated small group sessions. Taking School Staff and Parents below the water line; Dwayne’s information, and more importantly, the message woven around the information, connects with students. He provides a depth of information, knowledge and wisdom that let’s youth know “he gets it.” It will, and has for my schools, open lines of communication and embedded a deep sense of trust; connecting youth with all adults in the school. It provides youth an understanding that there is a safety net; a caring support network of adults there for them. “The Professional Development day you spent with our staff was conceivably the best session we’ve ever had in terms of building relationships and personal development. The vulnerability and honesty that day will lead our staff to personal and relational growth which can have profound, positive impacts for our students! “Dwayne Peace first came to our school in November 2016. At the time, we were struggling with the mental health of our students. In the first three months of the school year, we had eight students hospitalized due to suicidal ideation. Dwayne’s school assembly presentation “Life’s Challenges in Secondary School” had a huge impact on the student body and the mental health of our school. The three hour presentation captivated the entire audience, and allowed students and homeroom classes to identify areas that they need to work on in the weeks and months to follow. Students overwhelmingly agreed that all high school students need to hear this message! The presentation was well suited for grade 7-12 students. In the following days, all of our students took part in a small group session which I would recommend to all grade 9-12 students. Students strongly agreed that the small groups had an impact on how they view themselves, their friends, and all the other students in the school. The level of empathy in the school increased dramatically. As an administrator, I was pleasantly surprised with the impact staff taking part in the small groups had on improving the positive relationships between staff and students. Overall, Dwayne’s presentation substantially contributed to the change in our school culture from being on the edge and being reactive to being proactive with various mental health programs. Dwayne continues to work with the school and parents in our community. “We invited Dwayne Peace to one of our schools in 2012 and in 2013 to speak with our grade 7 to 12 students. The three hour presentation was interactive and thought – provoking. What a positive impact on the students! On top of that, the small group sessions were professional and solution-focused. The whole process has enabled the staff and students to have more authentic conversations and as a result, we established structures and processes in place to ensure regular student feedback and involvement. Students have demonstrated a higher degree of involvement and commitment to their school life and they are taking ownership of their learning.